Next up in my gore endeavors is making a broken bone prosthetic for my upcoming short film Coyote. For the non-squeamish’s viewing pleasure, here’s my research. The basics of the process I’m already familiar with. 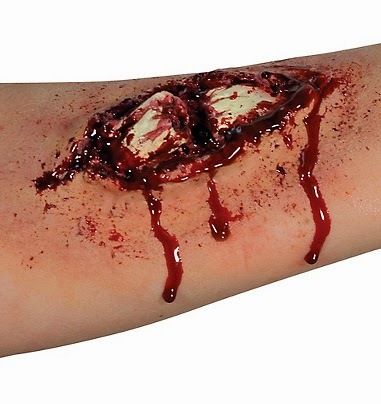 You get some bones and layer latex, powder or cream make-up and gore around them until it looks nice and creepy. What I want to make sure to do is to keep the actual anatomy in mind while creating the prosthetic. You can’t just place a broken chicken bone somewhere and paint around it and expect it to work. Does your actor have any allergies- latex, spirit gum, and red dye can all cause some bad reactions on sensitive skin and sometimes the reaction can cause anaphylaxis. So be cautious. What bone is going to break? In this project it is someone’s leg that gets snapped and busts through the surface of the skin and pants. 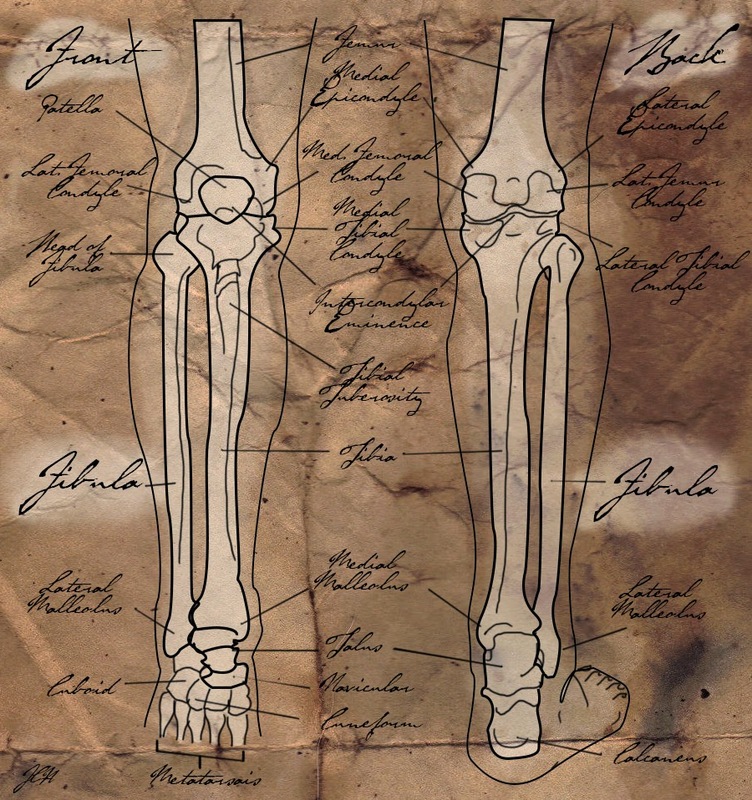 If you look at the human skeleton, the fibula seems like a good break choice. Twist it the wrong way with enough pressure- and SNAP! You’re down for the count. Whereas the tibia would probably take a lot more force to damage. 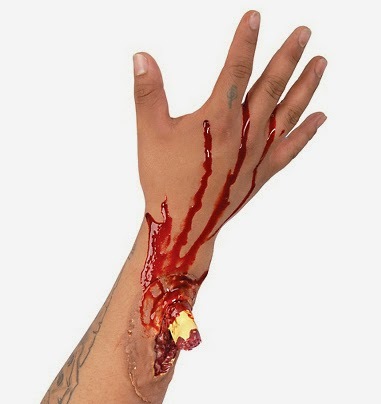 I have seen people use chicken or turkey bones for this kind of effect before, but if you want to go more realistic then you might want to try a pig bone. You may have to go to a proper butcher’s shop for that kind of a thing. Or, if you want to be vegan-friendly, you can make your bones out of straws and other materials. 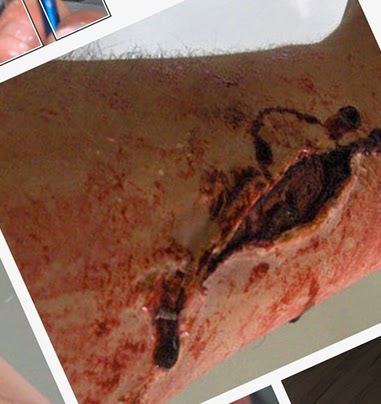 This instructable is a great step-by-step tutorial for a compound fracture, although it does require a few more materials than the average indie film maker (ie. me…) This is also the one that will show you how to make a pretty believable bone. And HERE is another tutorial which works through the process with less of the fancy stuff. If you combine the two techniques you should be able to get the effect of a great big broken fibula. Here’s some pre-made pieces I found to use as inspiration. And if you want to buy one I linked the image back to the original site in the caption. These make me think that I can get away with making the piece before-hand and use a combo of spirit gum and a thin coat of latex on the edges to attach it to the leg. Saving time while on set is a big plus.